It's been built up, been talked about, been rambled about over several beers and Season 1 DVDs at 4:00 in the morning, but now here it is - Puddles of Myself presents to you Puddles of My Podcast: The Gilmore Girls Edition. In this episode, I welcome Erik Lilleby, master quipper, nihilist and late night coffee drinker and novel reader, as well as the multi-talented artist Janelle sing to discuss the classic WB dramedy known as Gilmore Girls. 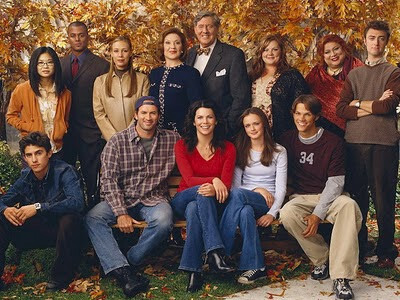 Be advised, if you do not follow the show Gilmore Girls, you will definitely enjoy this because of the witty banter that is used in order to explain some of the intricacies of the show. For those that know the show, in this episode we discuss, Lane Kim, Emily Gilmore as the best character on the show, Rory's boyfriends, Luke or Christopher, Suki's rapid weight gain and loss, and the top 5 Gilmore Girls moments - plus, KIRK! So, please sit back and enjoy this podcast with a big cup of coffee as Lorelai and Rory would at Luke's. This is the podcast that kicked open the door to a generation's consciousness.